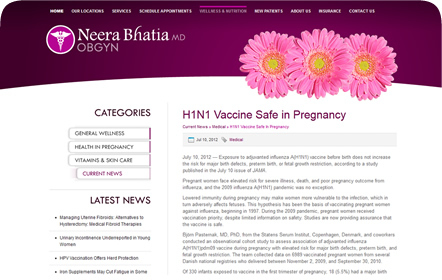 Dr. Neera Bhatia, M.D., is a skilled OBGYN specialist with 30 years of experience. She gives personalized service and attention to each patient no matter their age or state of health. What is most defining about her practice is her constantly evolving methodology, keeping up with the most current procedures and services. 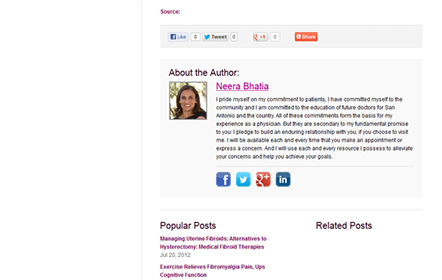 As a private physician, Dr. Bhatia dedicates herself to her clients and their well-being. Currently, she is installing a state-of-the-art 3D/4D sonogram to her practice. Dr. Bhatia initially had reservations about having a website, wondering if it would be useful to her practice and business. We asked ourselves, how could we show Dr. Bhatia’s quality and knowledge in her new website while providing a service to both her and her patients? 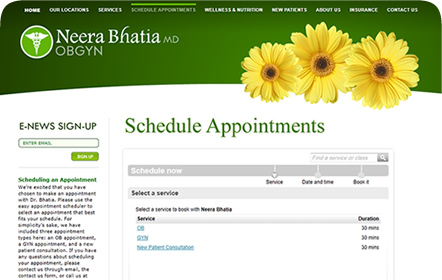 We included a scheduling system for her patients to easily choose the date, time and type of appointment they need while facilitating the appointment and new patient addition process for the staff. 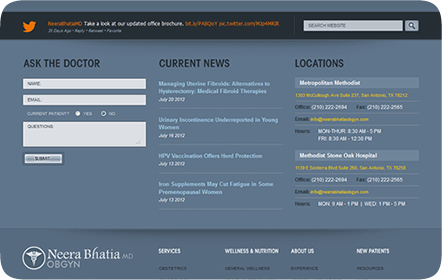 A news area keeps her patients up to date with the latest news and information. 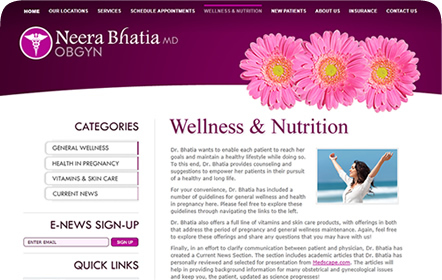 The website receives a steady growth of patients on a weekly basis and has helped Dr. Bhatia expand her business. 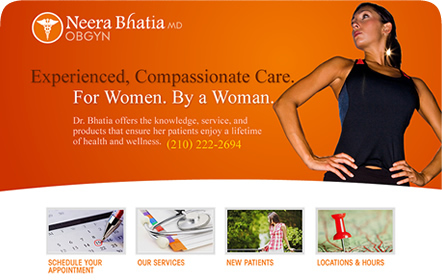 When you search for an OBGYN in San Antonio, you’ll find her on the first page of Google due to our SEO. Dr. Bhatia is so satisfied with these results, she’s come back to us to continue her overall brand with brochures, flyers, business cards, appointment cards, and lobby posters.